Congratulations on filing your Free Application for Federal Student Aid (FAFSA) and taking the first step towards getting cash you can use to pay for college. Now that your financial aid forms have been submitted, you and your family may be wondering what happens next. 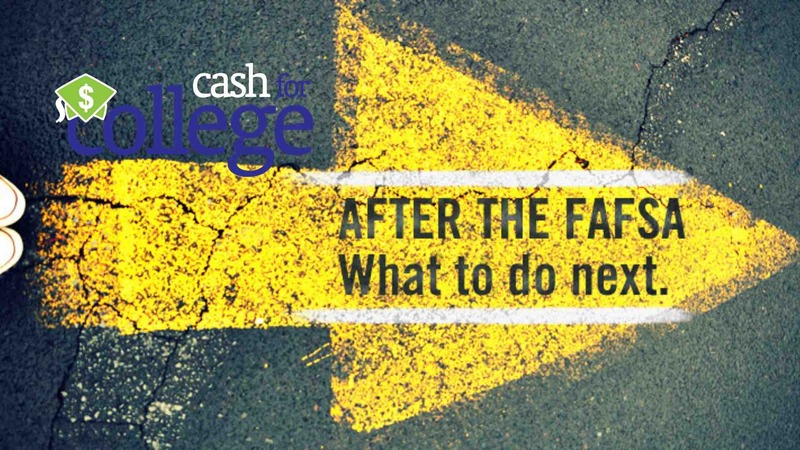 Here’s our guide outlining what happens after you’ve submitted your FAFSA. Make sure your SAR is correct. Double check that all the information you submitted via the FAFSA is correct in the SAR. It is easy to correct or update information in your FAFSA. Click here to learn more. The Expected Family Contribution (EFC) is used to determine your eligibility for Pell Grants and other financial aid. It is not the amount you or your family must pay for your college education. There are several factors that determine how much you will actually have to pay for postsecondary education, including how much money you qualify for in grants, scholarships, and work-study and how much attending your college costs. What if my EFC is not listed on my SAR? If your EFC is missing, it means that your FAFSA is incomplete. Review the SAR carefully to determine which information is missing or what the system has flagged as inaccurate. Make corrections as soon as possible. You can find out how here. For more advice on accepting financial aid from Federal Student Aid, click here. Make sure enough time has passed. If you submitted your FAFSA online with your FSA ID signature, you should expect your FAFSA to be processed in 3-5 business days. If you submitted via mail or mailed in the signature page, it will take 1-2 weeks. Check your spam folder. Search for emails from FederalStudentAidFAFSA@cpsemail.ed.gov. Double check that you actually submitted your FAFSA with your signature. Your FAFSA is not complete until you and your parents have signed it. Learn how here. Use the Federal Student Aid Information Center for help. You can call, email, or chat online with federal aid professionals. You can also ask your school counselor, career coach, or your college’s financial aid office for help. Follow Cash for College Alabama on Facebook, Twitter, and Instagram for more information on how you can get cash to pay for college. Have more questions? Give us a call at 205.939.1408 or come visit our office at 1016 19th St S, Birmingham, AL 35205.